We're the Vancouver chapter of the Original Red Box, inspired by their old skool gaming love. 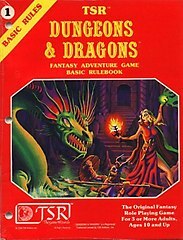 We play old editions of D&D (and related games) in Vancouver, BC. Everyone is welcome to game with us, whether it's your first or millionth time role playing. cr0m, thickets, PeteC & johnstone run the Black Peaks campaign using Red Box D&D & Labyrinth Lord with a little LotFP Weird Fantasy RPG mixed in. Planet Algol runs a Planet Algol campaign using LotFP Weird Fantasy RPG. We normally play Thursday evenings at Waves Coffee on Broadway & Spruce. See the calendar on our home page or check out the scheduling forums.